Two cute little boys grace the front cover of Caillou It’s Mine by Joceline Sanschagrin. One boy is holding a red ball with white stripes while the other boy sits on the floor next to a group of blocks. Given the title and the look on the face of the boys, it’s clear that the book is about private property and the concept of sharing. Caillou It’s Mine tells the story of the two little boys, Caillou and Philip. Philip arrives at Caillou’s house with a stuffed monkey and watches Caillou play with a red ball. The boys fight over Caillou’s ball, Caillou’s mommy intervenes, and the book ends with the two kids trading toys. The book is supposed to teach a lesson about sharing, but it’s length may be distracting to children who are old enough to understand all the words. At 24 pages, with several sentences on each page, Caillou It’s Mine is a long book given it’s intended audience of toddlers and pre-readers. Those youngsters who pay attention long enough to understand the entire book will likely learn the benefits of sharing. Unfortunately the length makes it hard for little children to read the book by themselves. The book is much better for parents to read to their children so that adults can explain the concept of sharing throughout the story. The illustrations by Tipeo consist largely of the two boys and Caillou’s mommy. While toys add some visual appeal to the pictures, babies and toddlers will be focused exclusively on the people. Thankfully the drawings show clear emotion with happiness, anger, and sadness obvious to even the smallest babies. The white backgrounds provide a good contrast with the colorful clothing and toys. 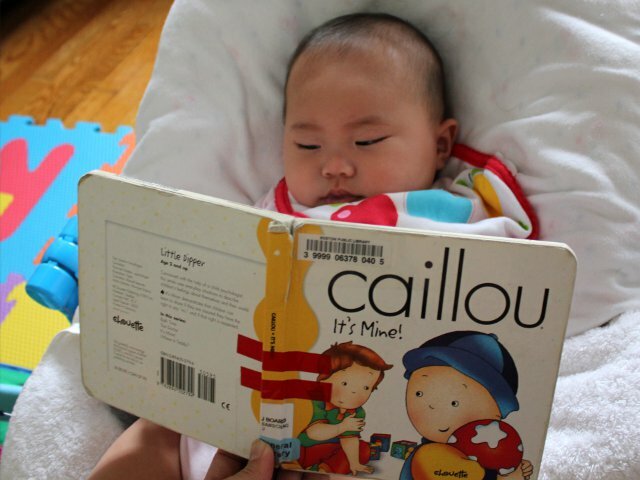 While there are many children’s books that teach lessons about sharing, Caillou It’s Mine is appropriate for a younger audience and serves as a good way to get children to learn life lessons from their books. Caillou It’s Mine is no longer in print, but used copies are available from Amazon for under $5 (including shipping).